Big Whopper Liar Day is a wacky holiday that even Pinocchio can appreciate! It began back in 1988… every third Saturday in September, people have gathered in New Harmony, Indiana to celebrate fish tales! The event was started by local trickster Aubry Robison, Jr., and even after his death the event lived on. Here’s how it works. About fifteen contestants take the stage in front of a crowd of four hundred folks. Each contestant gets four minutes to spin the most incredible yarn they can come up with. A team of judges award points for exaggeration, humor, stage presence and storytelling ability. It only costs $5 to get in (for spectators and contestants). It’s a small price to pay to hear or share a great whopper lie! The event is now a part of Kunstfest, a weekend-long German period festival in New Harmony. If you’re looking for a great coffee table book, this is a favorite of mine. 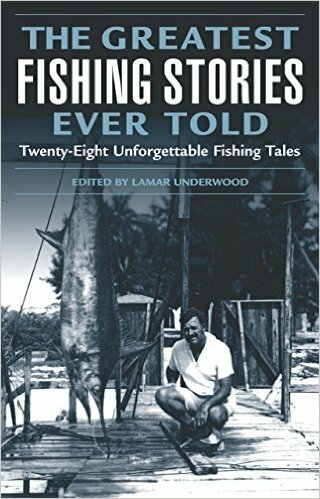 Published in 2004, this book of fishing tales will keep you “hooked” from cover to cover! It’s a series of books entitled THE GREATEST (fill in the blank) EVER TOLD. There are only twenty-eight fishing stories, so it is a quick read – but if your family is like mine, we like to pick up books from the coffee table when it’s cold or blustery outdoors – and just thumb through, half-reading, hoping to escape to a better climate. It’s not a book about big whopper lies, but extraordinary true stories about fishing excursions.